After taking apart many wooden pallets I found that I was running out of places to store all of the wood. 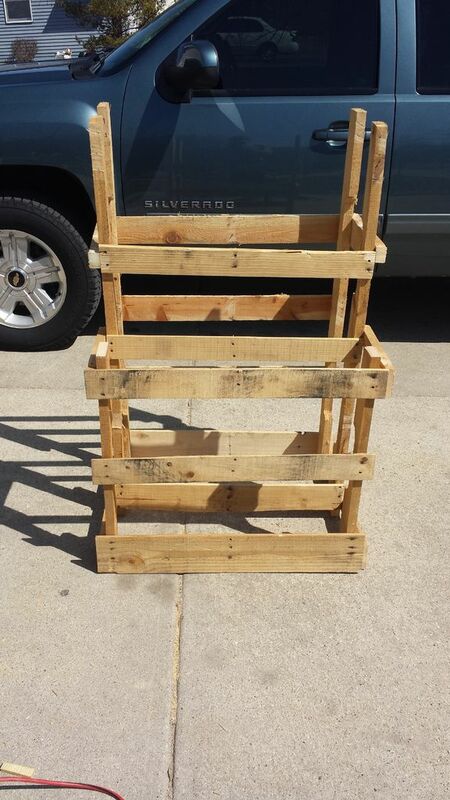 I decided to built a simple and fast container for pallet wood, made out of pallet wood. What I came up with was the P.A.L.L.E.T. or the Pallet And Loose Lumber Enclosure Tower. I cut each beam into two pieces, making four final pieces, each 14" long. You can make them as long or short as needed; I wanted my project to fit under an overhang/gutter on the side of my house. I found it easiest to lay one pallet on the ground and attach the sides there. I matched the sides with the planks of pallet wood for added stability and a somewhat cleaner look. I only used one screw per end this way as the wood did not move when flush against the planks. Wood glue or extra screws could be added for more stability. To finish up I trimmed the excess sides of the front planks so they would be flush with the side pieces. I also added a crude bottom by screwing extra boards to the bottom of the PALLET. I keep it outside, under a roof outcrop and while it isn't too pretty, it has held several pallets worth of wood through a couple of seasons and has not shown any signs of weakening. I hope some of you feel inspired and build your own bigger and better PALLET! Nice idea. Did something similar out of an old fence. Awesome. While I don't have access to any pallets, I do have access to scrap wood from adding a garage and other home improvement projects in our older home. Suggestion--with the addition of cross members both top and bottom, this would be a good storage project for dowels, pipes, or long handled garden/yard tools. We have one of those garden tool holders that just doesn't have enough space for all our tools. Add heavy duty rollers and maybe some handles and the P.A.L.L.E.T. would be mobile. Those are great ideas! I tried to use as few pallets and resources as possible (the more for using in other projects) but that also meant limiting it's utility. support every 12"-24"? So I've always been taught. omg I really need this. I was thinking of a sideways solution, but this makes more sense. Neat, No Fuss, Clever and Simple as per Instructables Philosophy. P.A.L.L.E.T. - I love a good acronym. Great instructable! Congratulations on being featured. Fantastic! And of course you didn't have to much time to build you had to put the real time into that AWESOME name! Great project! I love this. Convenient wood storage is one of life's underrated luxuries.